The Market. Matthew Watson. Agenda Publishing. 2018. Our economic life is inextricably shaped by the stories we tell in order to make sense of the economy, from the ‘folk economics’ of ordinary people to the theories held dear by scholars. This is particularly true for the discipline of economics which—as a swathe of work on economic performativity suggests—does not just describe an existing economy but rather ‘brings that economy into being’ in the first place, ‘creating the phenomena it describes’ through its concepts and models. 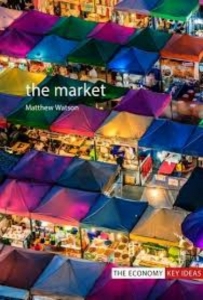 This concern sits at the heart of Matthew Watson’s new book, The Market, a critical enquiry into what exactly we mean when we talk about ‘the market’ and the consequences of allowing one particular understanding of it to prevail. In the book, Watson—a Professor of Political Economy in the Department of Politics and International Studies at the University of Warwick—unearths precisely why we feel so comfortable attributing disruptive economic change simply to the will of the market and the innate power it has to correct behaviour it views as contrary to its logics. For Watson the market has become ‘thingified’, ‘turned in political speech into a thing that thinks and acts for itself’ (5)—it has its own will, a sentiment we try to gauge, the capacity to exert force (‘market forces’) and it also exhibits behaviour which policymakers, investors and forecasters do their very best to anticipate and appease. This has created a political ‘reality’ in which the market has ‘been treated as if it was an omniscient entity, incapable of being overwritten’ or overruled by political action. But why is this, and is it true? Wrestling with whether this is a faithful representation of economic life or merely an explanatory model that favours one particular perspective, Watson traces the emergence and triumph of the market concept as we know it, deploying critical insights from political economy and undertaking a deeply-textured excavation of the history of economic thought. The Market first briefly introduces us to the dominant neoclassical market concept, which is centred around supply-and-demand dynamics and often rationalised through complex mathematical modelling. This ‘thingified’ vision of the market predominates not only as leitmotif of the popular economic imagination but also as a staple of ‘teaching texts in economics’, which ‘tend not to explore the history of economic thought, treating it as an unnecessary diversion from the primary objective of what the market concept is taken to mean in the here and now’ (18). 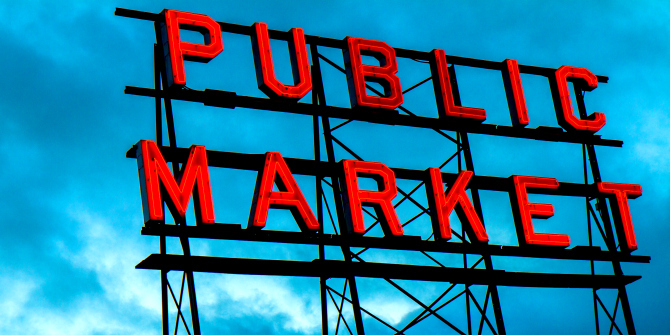 Beckoned by this dearth of historical engagement, Watson dives into the history of economics, anatomising three distinct and varying conceptualisations of ‘the market’ over time. Locating the present idea of the market in the long historical context out of which it originated, The Market reveals a history of inharmonious struggle over the best way to capture the complexity of economic ‘reality’, suggesting that how we think of the market now is just one of a number of competing ways rather than an objective truth. Chapter Three turns our attention to a relatively early market concept in the works of Adam Smith, usefully reconnecting our readings of his texts to his interest in moral philosophy and social theory. Extending the analysis beyond Smith’s canonical Wealth of Nations to incorporate interpretations of his Theory of Moral Sentiments, Watson finds an earlier, more human- and agency-centred market concept. Here ‘there is no external force called “the market” that bears down upon [people]’ (57) to submit to its will, but instead economic outcomes are the product of the moral reasoning and compromise undertaken by the participants on either side of a single transaction. This suggests a market concept ‘wildly at odds’ with the dominant one, where market relations are moulded by individual actors and become ‘a much more obviously do-it-yourself feature of everyday economic life’ (57) rather than dictated by the intractable logics of the market. The fourth chapter begins to account for the intellectual ascent of the dominant market concept, returning to the work of Cambridge economist Alfred Marshall and his attempts to explain supply and demand through his now-classic cross diagram. Watson places ‘the diagram back in the historical time during which its most essential characteristics were struggled over’, showing it to be one of a number of ‘competing origins’ of the geometry of supply and demand (82). In service of this, we are (re)introduced to some of Marshall’s predecessors and their work, including French mathematician Antoine Augustin Cournot, German political economist Karl Heinrich Rau, American Nobel-prize winner Paul Samuelson and several lesser-studied nineteenth-century theorists like Jules Dupuit, Fleeming Jenkin and Hans von Mangoldt. This genealogical approach usefully demonstrates that what is now accepted as a ‘universalising claim’ about the way in which markets operate (namely supply-and-demand functions) is the result of a long history of contestation which has ‘facilitated competing economic theories and competing practical insights’—leading Watson to question whether we are running ‘the risk of seriously overstating the ability of the demand-and-supply diagram to capture essential economic truths’ (82) as part of the incumbent market concept. Chapter Five builds on this by charting the journey towards this market concept and the attendant ‘move towards mathematical formalism’ (106). Along the way, Watson identifies an overwhelming shift to an economics ‘only for the most mathematically gifted’ (86) and sketches another rich intellectual history, touching on the Cowles Commission, Léon Walras, the Arrow–Debreu model and several other mathematical calculations used to make sense of the economy. The overarching theme for this chapter is the extent to which the mathematisation of economics has served to place ‘the market concept in a realm in which the decisions of actual people have no bearing on the discussion’ (106), meaning models in which we must submit to its bulldozing will have been able to pervade. Establishing through critical reflections in these chapters that ‘‘‘the market” is not something that can do anything to us of its own volition’ nor ‘to which agential characteristics might be ascribed’ (107), the final two chapters of The Market look at the ways in which the powerful idea of the market as a ‘thing’ has become infused in political consciousness and touch briefly on what alternative market concepts might look like. The Market provides a valuable history of ‘the market’ as an idea, rendering unfamiliar something we often take as a given. In doing so, the book makes a useful contribution to vibrant debates within political economy and feeds into timely conversations beyond academia about our position as economic subjects. The density and nature of the analysis—which demands a working knowledge of economic theory—may, however, make this a difficult text for the general reader. Nevertheless, at a time when we are increasingly facing pressure to imagine alternative economic futures in which the economy works for everyone, The Market’s call to action will certainly have wide appeal in its abandonment of the present market concept. David Dodds is a doctoral researcher at the Centre for Urban and Regional Development Studies, Newcastle University. His research sits at the confluence of economic geography, political economy and regional development and examines the ways in which new paths of economic growth emerge in old industrial regions.